St. Patrick's Day is one of the biggest parties of the year. The celebration is a tradition for many of us, whether we have a drop of Irish blood or not. If you're joining in the fun, you will definitely need a few great drinks for the occasion. From green beer to cocktails featuring Irish whiskey and other lucky spirits, there's a fun and tasty recipe to fit every taste. Mix one of these up and start spreading the Irish cheer—Erin go Bragh! 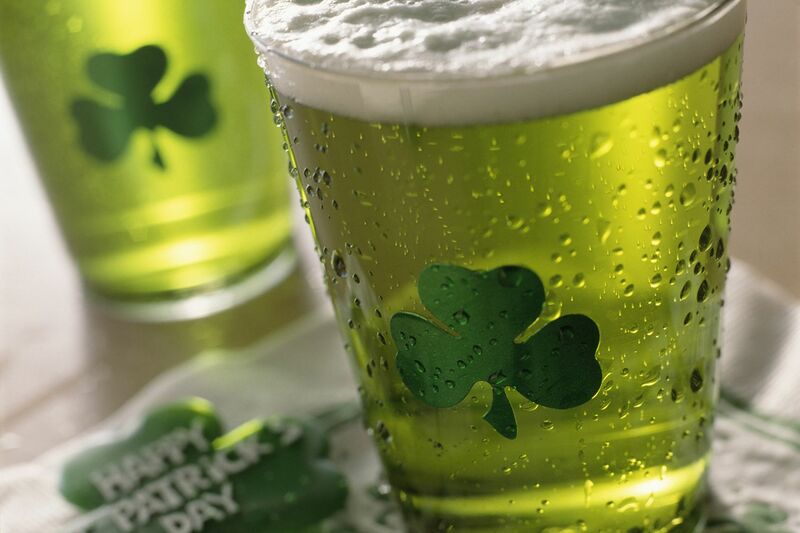 What is the one drink almost everyone wants to know how to make on St. Patrick's Day? Green beer, of course. It does have a certain allure, though we'd recommend a pint of Guinness for a more authentic Irish experience. If you've only enjoyed a green beer at the local pub, you'll be happy to know that it's beyond simple to make at home. Save some cash and discover the secret to transforming any light-colored beer into an emerald-colored brew. Green is the color of the day and there are many fascinating green cocktails that are perfect for St. Patrick's Day. Among our favorite recipes is the Green Dublin Apple cocktail. This is no ordinary green apple martini. No, this one is filled to the brim with Irish spirit thanks to the Irish whiskey which replaces the typical shot of vodka. The cocktail also uses white cranberry juice to sweeten the mix and allow the green apple schnapps to give the drink its signature color. If you're looking for a high-class option that celebrates Irish whiskey in all its glory, the Massey cocktail is a great choice. It's an ideal match for an Irish-themed dinner party filled with traditional foods. This cocktail has a classic style and you'll enjoy its array of flavors. The base is Irish whiskey and London dry gin mixed with sweet vermouth. To that, you'll add the herbs of Chartreuse and Campari. It's a truly fascinating combination. What would a St. Patrick's Day party be without a round of shots? A little less fun, possibly. While there are a number of fun shooter recipes that fit the Irish theme, we suggest you try this original take on the popular Jell-O shot. The Guinness and Green is unique and delicious. The first layer is a gelatin mix of Guinness and Irish whiskey and the top is a green-colored gelatin with Irish cream. It's almost as fun to make as it is to drink! It's time to enjoy a hybrid drink that gives you just a touch of Irish spirit but goes about it in a totally unique way. It is unusual, but before you judge it, you have to try it for yourself. The Irish Cactus is a slow-sipping, creamy lowball drink that's served on the rocks. It is made mostly of Irish cream, so here's your excuse to pour Baileys or whichever brand you prefer. The secret ingredient to the Cactus? Tequila, of course! Are you a fan of tonic water but want to give your gin a break for St. Patrick's Day? You're in luck because this recipe is the best of both worlds. The Leprechaun is as simple as any other tonic drink. All you need is your favorite Irish whiskey and a bottle of tonic. The whiskey background against the dry soda is invigorating and the recipe is so easy that it's hard to pass up. With one simple substitution, you can ​give your Manhattan an Irish twist. The Black and Red is a very fine drink that any whiskey lover will enjoy. This whiskey and sweet vermouth drink is very specific on the whiskey of choice. It features Black Bush, which is an excellent upgrade to the original Bushmills you're probably used to. Look for the black label and you'll soon discover why this old-fashioned whiskey remains one of the best Ireland has to offer. Sweet with a spicy side, the Pot of Gold is a darling drink that will appeal to vodka martini fans. Though it doesn't have a drop of Irish spirits, it includes green ingredients a-plenty so it's still a good fit for the party. The recipe is low-calorie and filled with fresh flavors. Pick up a crisp, clean vodka and an elderflower liqueur or syrup. You'll also need fresh cucumber and mint. The spicy kick comes from a short pour of ginger beer, which finishes the mix off perfectly. Smooth and creamy, the Shamrock Shaker is an absolute delight. It's simple and satisfying and light on the liquor, ideal for anyone who's looking for a delicious drink without the​ hangover risk. This recipe requires just three ingredients—Kahlua is the main spirit and its coffee flavor is accented with the sweetness of amaretto. Then just add a long pour of milk and give it a hearty shake. In the end, you'll have a lightly boozy milkshake that's fancy enough for any party. Step away from everything you associate with St. Patrick's Day cocktails and consider mixing up an Irish Encounter. It's fun, delicious, and an excuse to break out the blender. The "encounter" in the recipe refers to the short shot of Bailey's. Beyond that, we're looking at a frozen Piña Colada, complete with rum and plenty of coconut milk. We even toss in a fresh banana.